The capital of Spain has more to offer than even its finest art galleries and museums, with a series of unusual and unique sights to see. Madrid is the capital of Spain and is set in the heart of the country. The city is full of museums, art galleries, restaurants, parks and a shopping experience like no other. The city of Madrid also has a unique side waiting for visitors, including a museum dedicated to the blind or visually impaired, a genuine Egyptian temple, the remains of an ancient Moorish tower in a parking garage, a whimsical fallen angel and the world's oldest operating restaurant. In most cases, a visit to a museum is a visual experience – rarely do you get a chance to touch anything. The Typhlological Museum was created by ONCE – the National Organization of the Spanish Blind – for visually impaired people, to allow them to experience art and architectural masterpieces through the mode of touch. The blind or visually impaired can explore many of the most important works of art and architectural monuments with specially textured, raised details and vivid colours. 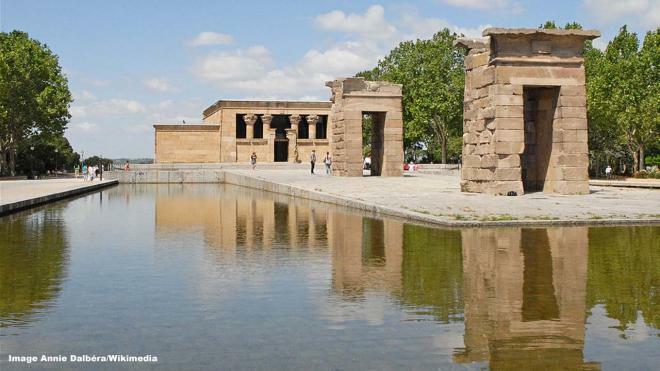 Close to Plaza de España, in the heart of the city, is an ancient Egyptian temple. It was gifted to Spain by Egypt in 1968 as thanks for the country’s efforts in saving historic sites that would have otherwise been flooded when the Aswan High Dam was complete. The temple stood in the Nile Valley of Egypt from the 4th century BCE and is dedicated to the Egyptian gods Isis and Amun. The building is in a park, surrounded by a pool which reflects its image. There are also great views of the city.